Luxurious, anti-aging facial cleansing gel provides an exhilarating, peachy clean freshness to help produce a beautiful, fresh, youthful-looking complexion. An advanced deep pore resurfacing action helps diminish the appearance of fine lines, wrinkles and other signs of aging. 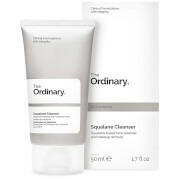 Ideal for all skin types (except sensitive skin) including dry, normal, combination, oily and blemish-prone skin. 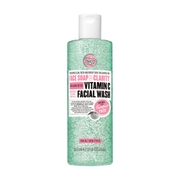 Helps to effectively cleanse pores, dissolve makeup, emulsify oil and improve skin texture as it gently sweeps away dead skin cells and impurities that can make the complexion appear more dull. Glycolic and Salicylic Acids as well as brightening botanicals exfoliate and clarify the skin, leaving it ultra clean, refined and revitalized. Peeling gel visibly rolls, lifts and sweeps away dead skin cells when massaged onto skin. Multi-action enzymes (pineapple, pomegranate, keratinase) and cellulose effectively peel and help uncover a smooth, fresh, new complexion. Removes impurities and purifies clogged pores for a youthful, radiant, firmer look. This ultra-gentle gel helps soothe, hydrate, and De-Tox™ dry skin with botanical extracts of Cucumber, Papaya, Chamomile, Pineapple, Sugar Maple, Sugarcane, Orange, Lemon, Bilberry and Aloe. Excellent to soothe skin after sun exposure, peels, waxing, facials, extractions, etc. NEW! $35 OFF, a $57 Value! Anti-Aging Cleansing Gel 1 fl: Use daily as needed. For external use only. Sunburn Alert: This product contains an alpha hydroxy acid (AHA) that may increase your skin’s sensitivity to the sun and particularly the possibility of sunburn. Use a sunscreen, wear protective clothing and limit sun exposure while using this product and for a week afterwards. Cucumber De-Tox™ Bouncy Hydrating Gel 0.5 fl: For best results, apply twice daily to face and neck and with continued use. For external use only. Firmx® Peeling Gel 0.5 fl: Apply a generous amount on clean dry skin. Gently massage in a circular motion to roll, lift and sweep away dead skin cells. Rinse well with water. For external use only. 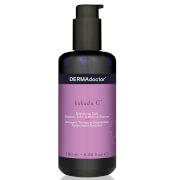 Cucumber Gel Mask Extreme De-Tox™ Hydrator 0.47 fl: Apply a generous coat on clean skin. Rinse after 10 minutes with cool water. Use 2-3 times a week or daily. For external use only. Anti-Aging Cleansing Gel 1 fl: Water/Aqua/Eau, Sodium Laureth Sulfate, Cocamidopropyl Betaine, Lauryl Glucoside, Propylene Glycol, Salicylic Acid, Glycolic Acid, Quercus Alba Bark Extract, Citrus Grandis (Grapefruit) Fruit Extract, Prunus Persica (Peach) Fruit Extract, Citrus Aurantifolia (Lime) Fruit Extract, Citrus Limon (Lemon) Fruit Extract, Arginine, Tilia Cordata flower Extract, Allantoin, Bht, Panthenol, Butylene Glycol, Potassium Sorbate, Sodium Benzoate, Phenoxyethanol, Amyl Cinnamal, Linalool, Fragrance/Parfum, Red 40 (Ci 16035), Yellow 5 (Ci 19140). Cucumber De-Tox™ Bouncy Hydrating Gel 0.5 fl: Water/Aqua/Eau, Dimethicone, Butylene Glycol, Glycerin, Polysilicone-11, Cucumis Sativus (Cucumber) Fruit Extract, Cucumis Sativus (Cucumber) Fruit Water, Oryza Sativa (Rice) Bran Extract, Sodium Hyaluronate, Retinyl Palmitate, Tocopherol, Ascorbic Acid, Tocopheryl Acetate, Cucumis Melo (Melon) Fruit Extract, Pyrus Malus (Apple) Fruit Extract, Rose Extract, Rubus Idaeus (Raspberry) Fruit Extract, Purnus Armeniaca (Apricot) Fruit Extract, Caprylic/Capric Triglyceride, Octyldodecanol, Santalum Album (Sandalwood) Wood Extract, Sodium Propoxyhydroxypropyl Thiosulfate Silica, Peg-8 Dimethicone, Mica, Peg-240/Hdi Copolymer Bisdecyltetradeceth-20 Ether, Acrylamide/Sodium Acryloyldimethyltaurate Copolymer, Hydroxyethylcellulose, Imethylacryamide/Crylic Acid/Polystyrene Ethyl Methacrylate Copolymer, Sodium Phosphate, Disodium Phosphate, Sodium Acryloyldimethyltaurate/Vp Crosspolymer, Sodium Nitrate, Polysorbate 60, Silica, Potassium Laurate, Polysorbate 20, Hexylene Glycol, Sorbitan Oleate, Isohexadecane, Decyl Glucoside, Polysorbate 80, T-Butyl Alcohol, Glyoxal, Sodium Benzoate, Potassium Sorbate, Caprylyl Glycol, Phenoxyethanol, Yellow 5 (Ci 19140), Blue 1 (Ci 42090). Firmx® Peeling Gel 0.5 fl: Water/Aqua/Eau, Peg-32, Cellulose, Butylene Glycol, Citrus Aurantium Bergamia (Bergamot) Fruit Water, Sorbitol, R-Bacillus Licheniformis Keratinase, Ananas Sativus (Pineapple) Fruit Extract, Lactobacillus/Punica Granatum Fruit Ferment Extract, Leuconostoc/Radish Root Ferment Filtrate, Sodium Hyaluronate, Glycerin, Sodium Hydroxide, Citric Acid, Tetrasodium Edta, Algin, Carbomer, Tromethamine, Isopropyl Myristate, Sodium Chloride, Calcium Chloride, Potassium Sorbate, Sodium Benzoate, Mica, Phenoxyethanol. Cucumber Gel Mask Extreme De-Tox™ Hydrator 0.47 fl: Water/Aqua/Eau, Butylene Glycol, Cucumis Sativus (Cucumber) Fruit Extract, Ananas Sativus (Pineapple) Fruit Extract, Vaccinium Myrtillus Fruit/Leaf Extract, Carica Papaya (Papaya) Fruit Extract, Acer Saccharum (Sugar Maple) Extract, Saccharum Officinarum (Sugar Cane) Extract, Aloe Barbadensis Leaf Juice, Chamomilla Recutita (Matricaria) flower Extract, Chamomilla Recutita (Matricaria) flower Oil, Citrus Limon (Lemon) Fruit Extract, Citrus Aurantium Dulcis (Orange) Fruit Extract, Mangifera Indica (Mango) Fruit Extract, Sodium Pca, Allantoin, Glycerin, Propylene Glycol, Disodium Edta, Sodium Hydroxide, Citric Acid, Carbomer, Triethanolamine, Polysorbate 20, Potassium Sorbate, Sodium Benzoate, Phenoxyethanol, Yellow 5 (Ci 19140), Blue 1 (Ci 42090). Cleansing Gel: 30ml / Bouncy Hydrating Gel: 15ml / Peeling Gel: 15ml / Gel Mask Hydrator: 15ml.